Sparkling Cranberry White Chocolate Cupcakes made with a moist vanilla cupcake with cranberry mascarpone filling and a white chocolate buttercream! 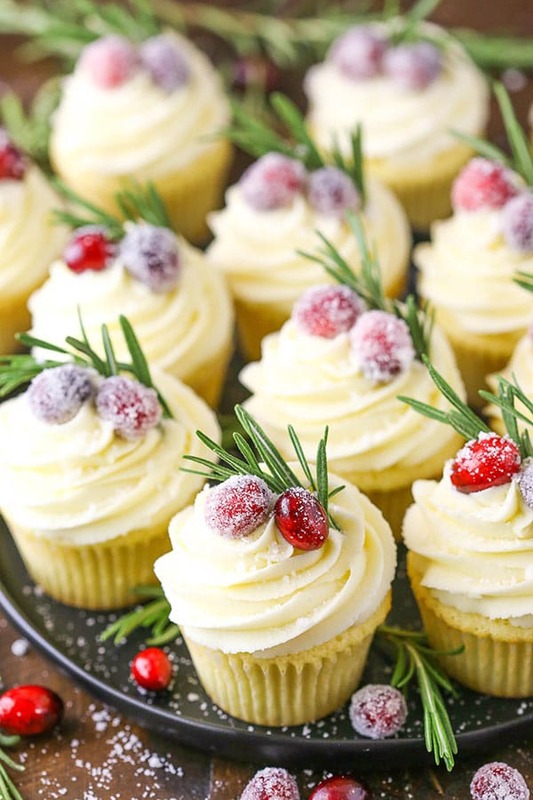 Topped with sparkling sugar cranberries and a sprig of rosemary, they’re the perfect holiday cupcake! It’s hard to believe that Christmas is now less than two weeks away! I’m most definitely not prepared. But we are getting there and I’m ready to relax with my family as Christmas gets closer. With this being the boys’ first Christmas, I want to enjoy it and have some fun. One thing we always know is that there will be family and good food! Of course, with Christmas also comes by birthday (yes, the same day) so there’s always even more going on. We actually tend to celebrate my birthday a few days early simply to keep Christmas Day from being too crazy. There’s always a lot going on, but I’m all about keeping it as simple as possible. 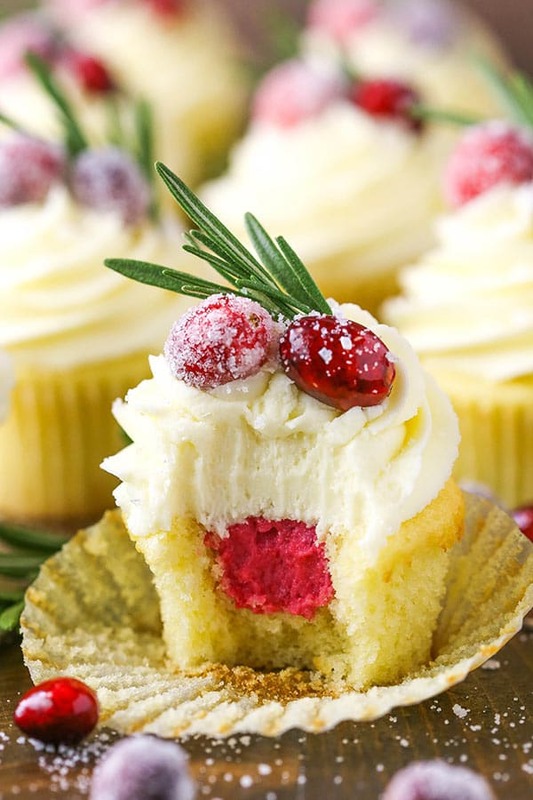 And since a holiday certainly isn’t a holiday (nor is a birthday a birthday) unless there’s cake, these Sparkling Cranberry White Chocolate Cupcakes are a must. I can see these becoming a new family favorite that we might just have to put on repeat. The moist cupcake, the AMAZING filling and the white chocolate buttercream are all wonderful together. They just have a special feel and I love them! 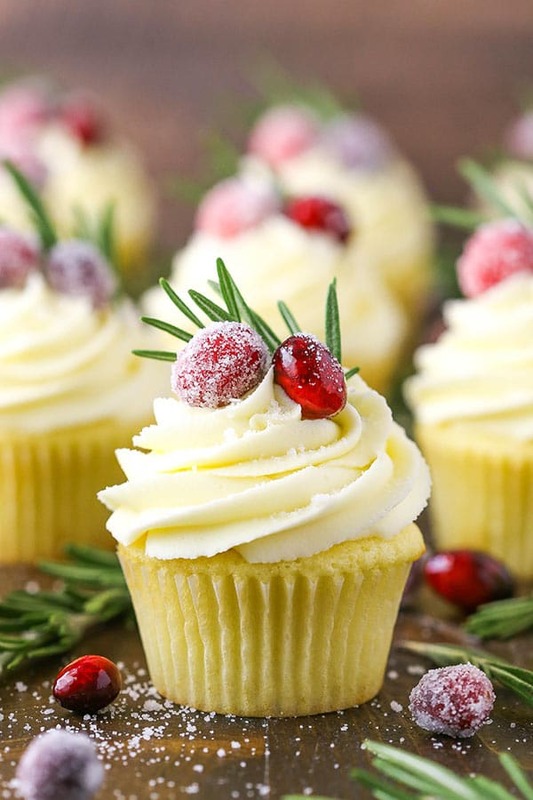 So, the first step to making these Sparkling Cranberry White Chocolate Cupcakes is to make the sparkling sugar cranberries that will decorate the top. Combine water and sugar and heat it on the stove until the sugar is dissolved. This will give you a simple syrup and you’ll add the cranberries to it to soak. I usually let them sit overnight. After they sit for a while, roll of few at a time in some sugar to coat them and then let them dry for about an hour. You’ll have the most festive cranberries! Next up is the moist vanilla cupcakes that will be the base of these beauties. It’s a cupcake version of my Moist Vanilla Cake and I love the combination of butter and oil it uses. 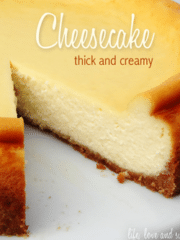 The perfect mix of flavor and moisture! After creaming the butter, oil and sugar, next up is adding the eggs. 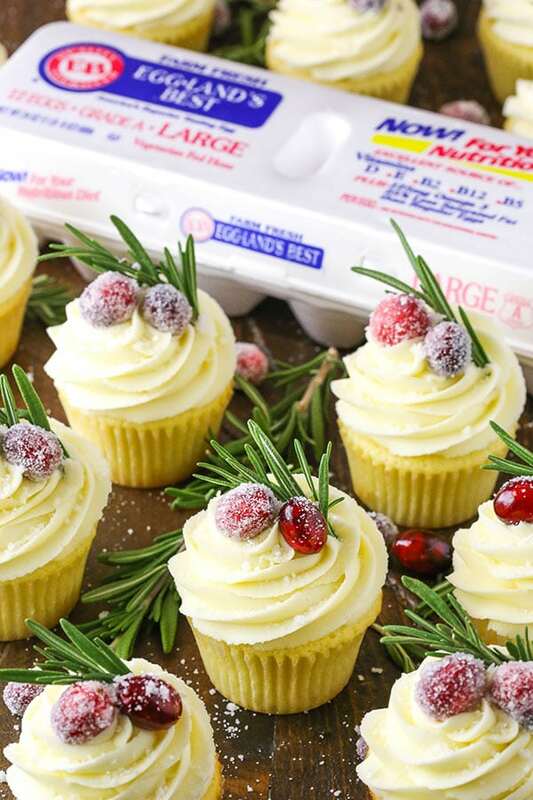 I love using Eggland’s Best eggs – both in baking and cooking. I ate them like crazy when I was pregnant with the boys and now they have them most mornings for breakfast. They have six times more vitamin D, more than double the Omega 3s, and 38% more lutein when compared to ordinary eggs. Plus, they’re only 60 calories! 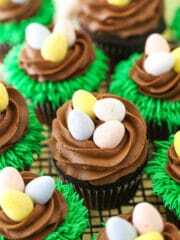 I love giving my boys the best and these eggs definitely are – so they are perfect in these cupcakes! You’ll also add a little vanilla extract, then it’s on to the flour, baking powder and salt, which are added along with the milk. You end up with a lovely, moist and fluffy cupcake. While the cupcakes are cooling, it’s time to work on the filling. Much like when you start on the sugared cranberries, you’ll combine some water and sugar, but this time we’ll use less water. Just enough water to get things wet and then most of the moisture comes as the cranberries release their juices. Cook the sugar, water and cranberries and allow the berries to pop and let out their juices and then let it all simmer a bit as it thickens. After it’s thickened, add it to a food processor and puree until smooth. Set that mixture aside and let it cool to room temperature, then stir in the mascarpone cheese. I LOVE the addition of the mascarpone cheese here. I debated whether or not to just leave the cranberry filling as is, but with it being so tart, the mascarpone does a wonderful job of toning it down a bit without sweetening it too much or taking away from the cranberry flavor. It’s also adds such a nice, smooth creaminess that compliments the whole cupcake. It’s hard to decide which element of these Sparkling Cranberry White Chocolate Cupcakes I love the most. Obviously, the cake is wonderful – I use it regularly. The cranberry filling with the mascarpone cheese is definitely a new favorite. But I also love me some white chocolate and it comes through in the best way in this buttercream. To make it, you’ll beat your butter until smooth, then add the melted white chocolate in a couple batches. I find it helpful to add it in batches so that you can ensure that it incorporates well, without clumping. Next up, you’ll add the powdered sugar with a pinch of salt and some cream. Perfection! The final Sparkling Cranberry White Chocolate Cupcake is a major treat and most certainly a new family favorite! It’s so perfectly festive for the holidays, I definitely think this will be one we start coming back to every year. I hope you enjoy it and that it becomes a favorite for your family too! Speaking of your family favorites, I want to know all about them! 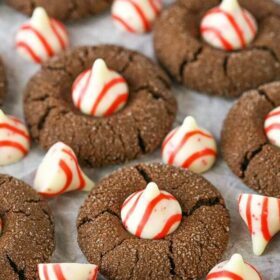 What are your favorite recipes to make for the holidays? I’ll be partnering with Eggland’s Best to bring you another post next week and we want to feature one of your family favorites! 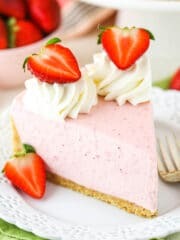 So, if you’re interested in possibly having your family’s recipe featured here on Life, Love and Sugar, leave the recipe for me in the comments or send it to me via email (lifeloveandsugar[at]gmail.com) and I’ll select a recipe to be featured next week! I’ll be picking a winner within 48 hours! I can’t wait to see your favorites! These Sparkling Cranberry White Chocolate Cupcakes are made with a moist vanilla cupcake with cranberry mascarpone filling and a white chocolate buttercream! 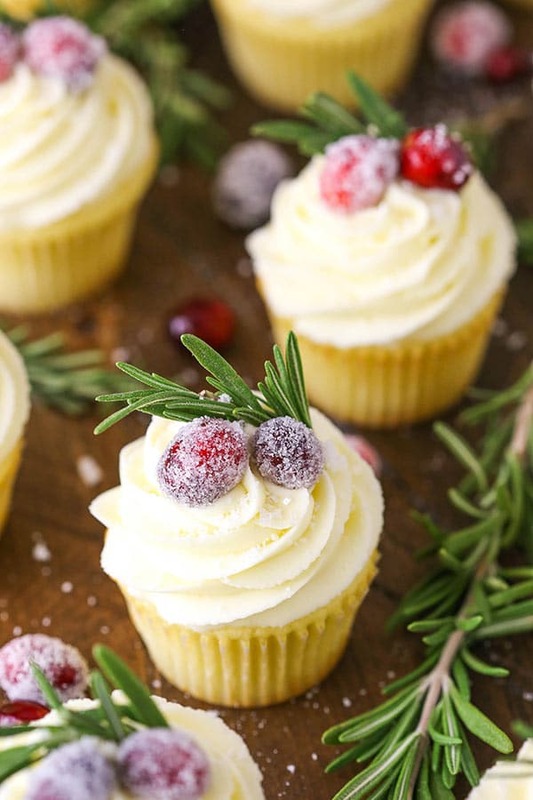 Topped with sparkling sugar cranberries and a sprig of rosemary, they are the perfect holiday cupcake! 1. To make the cranberries, bring 1/2 cup sugar and the water to a simmer in a saucepan. Heat until sugar is completely dissolved. 4. Refrigerate cranberries in syrup overnight or for several hours, stirring a couple times to coat with syrup. 5. To make the cupcakes, prepare a cupcake pan with cupcake liners and preheat the oven to 350°F (176°C). 6. Combine the flour, baking powder and salt in a medium sized bowl and set aside. 7. Add the butter, sugar and oil to a large mixer bowl and beat together until light in color and fluffy, about 3 minutes. Do not skimp on the creaming time. 8. Add the eggs one at a time, mixing until mostly combined after each. Add the vanilla extract with the second egg. Scrape down the sides of the bowl as needed to be sure all ingredients are well incorporated. 9. Add half of the dry ingredients to the batter and mix until mostly combined. 10. Slowly add the milk and mix until well combined. The batter might look a little curdled, but that’s ok.
11. Add the remaining dry ingredients and mix until well combined and smooth. Scrape down the sides of the bowl as needed to be sure all ingredients are well incorporated. Do not over mix the batter. 12. Fill the cupcake liners about 3/4 full and bake for 14-16 minutes or until a toothpick inserted into the center comes out clean. 13. Remove cupcakes from the oven and place cupcakes on a cooling rack to cool. 14. While the cupcakes cool, make the cranberry filling. Combine the water, sugar and cranberries in a medium saucepan and cook on medium heat. Allow the cranberries to pop and release their juices. Let the filling continue to cook for approximately 8-10 minutes, until the mixture thickens. 14. Transfer cranberry mixture to a food processor and puree. Set aside and allow to cool to room temperature. 15. While everything is cooling, finish the sparkling cranberries. Remove the cranberries from the syrup a few at a time and roll in the remaining cup of sugar. 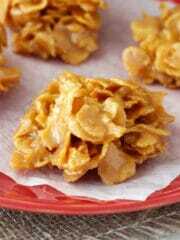 You’ll need to roll them a few times and sprinkle the sugar over them to get a full coat of sugar on them. 16. Set cranberries aside to dry for about 30 minutes to an hour. 17. When the filling has cooled, add the mascarpone cheese and stir until well incorporated. Set aside. 18. When the cupcakes are cool, the filling is ready and cranberries are dry, make the frosting. Place the white chocolate chips in a microwave safe bowl and heat in 10-20 second increments, stirring between each, until white chocolate is melted and smooth. Set aside to cool a bit. 24. To put the cupcakes together, use a cupcake corer or knife to remove the centers of the cupcakes. 25. 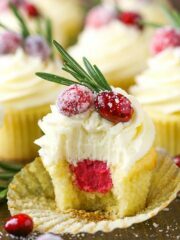 Fill the centers of the cupcakes with the cranberry filling, then top the cupcakes with the white chocolate buttercream. 26. 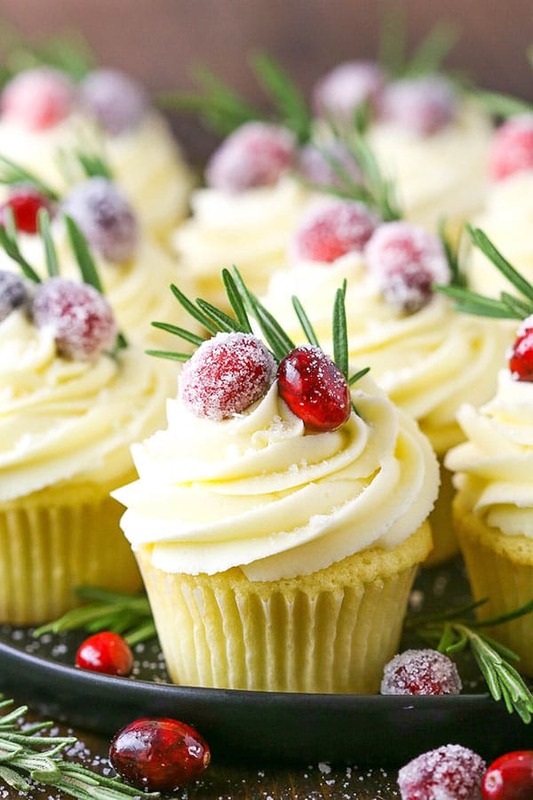 Finish off the cupcakes with 2-3 sparkling cranberries and a bit of rosemary. I also sprinkled a little bit of the leftover sugar from the sparkling cranberries. 27. Refrigerate cupcakes until ready to serve. Cupcakes are best served cool, but not cold. Cupcakes are best for 2-3 days, but would be ok for 4-5. NOTE: I add the mascarpone cheese while it’s still relatively fairly cool. I find that if it gets too warm and soft, it doesn’t thicken back up well. Hello this cupcakes look so nice!! I will do them this weekend. Just one step I did not understand is the white chocolate melted. 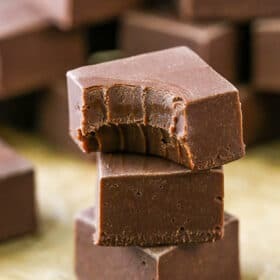 Do we have to melt the chocolate and let it cool down or we mix the chocolate with butter while still hot? How do we do that? You’ll let it cool a bit, so that it’s not too warm, but it obviously still needs to be pourable. I’ve never had an issue with it melting the butter, but it can clump in the frosting if it’s added too warm. That’s also why I like to add it in batches – to ensure it incorporates well without clumping. Thank you so much Lindsay!!! I will try this weekend hope I can do them as good as you or almost :-). 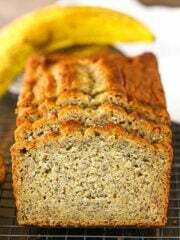 Thank you for your blog and recipes they are spectacular. These look so pretty! I just love a sugared cranberry, they make everything look prettier! Thanks Jessica! I totally agree – they’re so festive! What are the green “pine needles”? Rosemary?? These are delicious! Best cupcakes I’ve made yet. I used every mixing bowl in my kitchen, but totally worth it. They were a big hit at our holiday party. Thanks! These look phenomenal!! And those cranberries on top!! Putting this on my “to make” list! I follow you on instagram, have made several of your cakes and LOVE your stuff! 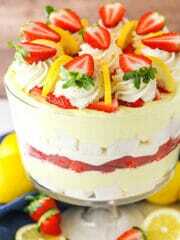 You are one of my “mentors” for cakes/cheescakes. LOVE your ideas! Thank you so much! I’m glad you are enjoying the recipes! Can you make this with raspberries or strawberries instead of cranberries? That should be fine. They might not do well as “sparkling” berries, but they’d be fine in the filling. Hello ! 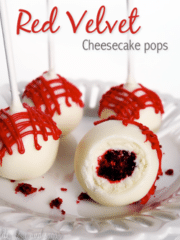 I would love to make these for a potluck . Can I make the filling and sugar cranberries a day before ? Yes, they can definitely be made ahead! Oh my goodness. I for one love your Blog. All your recipes I have tried are fantastic. I tried this specific cupcake last week. I usually dislike anything Cranberry. Then cranberry and rosemary. I just was not sure. Whoa… Madame these were incredible. The variance of different flavors were amazing. I am a single mom. So trying to create and start my own cupcake business. 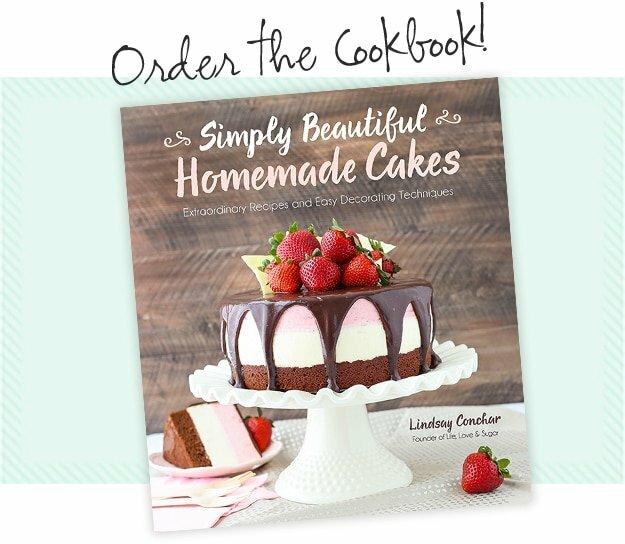 Once I save up enough money your cookbook will be first ever book I buy for my new business. Your recipes are by far the best I have ever had the pleasure to make. 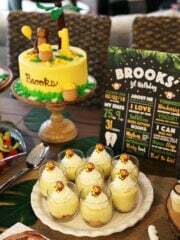 These cupcakes are amazing!!!! I baked them for a wedding reception and they were a hit! I was wondering what brand of mascarpone you use? Awesome! So glad to hear that! 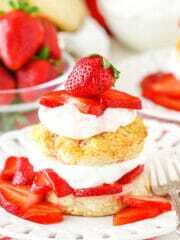 I use this mascarpone. What tip do you use to pipe your buttercream? Hi what tip did you use to frost these?